Keep the email address of your leaders secure and ease transition between leaders with this feature. You can create email addresses such as treasurer@ and have it forwarded to the treasurer's own email account. When you change treasurers, just change the email address. Take email to the next level by creating email distribution lists such as fundraising@, recruiting@, and technology@. You decide who receives email from these groups and who is allowed to send email to them - all others will be denied. This feature gives you the power to easily communicate with your members via email while protecting them from email SPAM. The Email lists announce@ and leaders@ can be automatically created and updated each time your Roster changes. No need to manually update your most critical communication groups. SOAR does it for you! 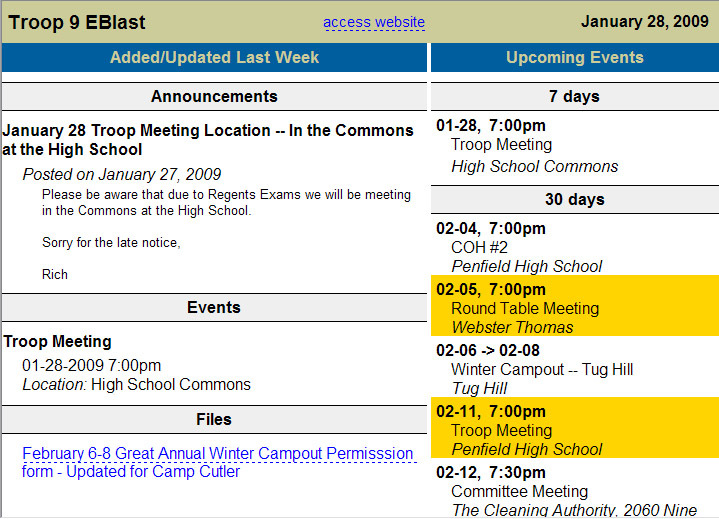 Imagine if all your leaders had to do was post announcements and events to your website and your members automatically recieved the information. EBlast does exactly that ! Each week on a day you choose, your SOAR website will send out an email to all members. It will contain any new/updated items in the last 7 days (i.e. announcements, events, etc) and a list of upcoming events in the next 30 days. With EBlast your members can't miss information - it is in their Inbox every week. Click here for an example of what an EBlast will look like. For any calendar event you can enable Event Registration and configure settings such as signup type (Family or Individual), event cost, cutoff date, and maximum registrants. You can even vary the cost by the type of registrant - youth, adult, or other. To make the feature even more useful, SOAR has linked Event Registration with the Online Payments feature. After a member registers for an event they can then pay for the event fees online - right then and there. No need to collect a check later. Throw away those paper signups sheets at every meeting and go online ! You can now collect payments online via major credit cards and PayPal accounts for such items as yearly dues, event fees, mrechandise, and much more. SOAR has created an easy to use interface for organizations to create their own list of items that members can purchase, including a shopping cart and checkout system. Each item can have its own price, description, and configurable options. To utilize the SOAR Online Payments feature, all you need is a free business account with PayPal. PayPal is a global leader in online payment solutions.